I had a deck built in 2001 using Trex that was Gray colored. It was built by a licensed contractor, and passed inspection by the city. Almost every board has warped, bulged, curled up, and has mold. This spring the stairs have almost come off the deck, and the problems seem to worsen each year. I contacted a builder to come and see if the deck can be repaired, and he told me that TREX was defective in the year that I built, so I started the process of taking and mailing pictures and the company complaint form. The company sent a man out to look at the deck, and today I got my reply from Trex that the deck was built incorrectly, and that none of my problems are related to defective product. When they say that they guarantee their product, they do not. I am disappointed that once again another company is not standing behind their product. I am frankly sick and tired of high prices, inferior product, and these companies that get away with it! They have not heard the last from me. Has anyone been able to get them to reverse their finding? We also have been very disappointed with our Trex deck, installed in early 2007. Approximately one third of the deck is now covered with mold and mildew spots. After cleaning with products recommended by Trex, these spots are not entirely removed. Even when the spots do appear to wash out, they return in a couple of weeks. 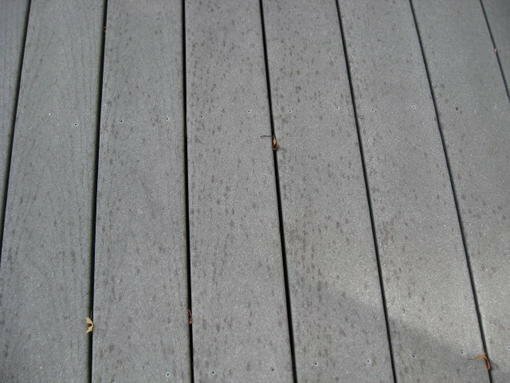 The discoloration and fading in the portion of the deck where the cleaners were used is quite ugly, and the spots remain. We submitted a claim, along with photos, which was just rejected by the Trex company. I am very disappointed with this product and would not recommend that anyone purchase it. I am a representative of Trex and welcome your questions. Please contact me at the office directly to help address your concerns. I, too, have had the same issues with Trex. Cleaning is difficult and the problem returns within 1-2 weeks. They know they have a problem and will not address it. Can I have your email address so we can band together? There are class action suits supposedly in progress, but no word yet. Consumer-rights law firm Hagens Berman filed a lawsuit on behalf of owners of Portico composite decking alleging that it the decking is defective and prone to mold and fungal growth that results in large black spots. The lawsuit claims that manufacturer Fiberon refuses to live up to its warranty obligations to replace or repair the decking. Consumers can learn more about the lawsuit here: www.hbsslaw.com/portico. We had Trex decking on our old house and it always seemed to need to be cleaned, luckily, we were able to get our general handyman to do this with his powerwasher because we didn't have one of our own. He did this, cleaned our gutters, and a bunch of other maintenance jobs for us. I agree though, for the money, I thought the quality would be better. I used Trex for my deck built in 2007. In 2013, I have warped boards and boards that are pealing. I followed the complaint procedure and \Trex came back with an offer to replace all of the boards I had, in effect: a new deck. I have to pay for installation, but the person I dealt with was pleasant and more than willing to help. I am going back to Trex to replace the boards on my deck. I have no complaints about the company and certainly got a full refund in Canadian prices. Their new product deserves a try as far as I am concerned.